Discover a comprehensive new system to produce a massive stream of traffic on a daily basis in this special e-report! It's yours FREE for immediate download when you join and confirm your subscription to our subscriber list. Attention: It's The Amazing Secret Weapon Any Serious Website Owner, Affiliate Marketer, or SEO Expert Would KILL to Possess! "Instantly Unleash The Explosive Power Hidden Behind This Well-Guarded Secret To Dominating Key Search Engine Rankings In Under 7 Days Using This Embarrassingly Simple 'Backdoor' Shortcut!" "Just Read Below To Learn How You Can Harness The Full Power of Internet Press Releases To Easily Wipe-Out Your Competition For Nearly All Of The Top Rankings You Want!" To get almost all the top rankings you want -- because, in under 7 days, you now have dozens, up to hundreds of new backlinks flooding into your website... and you have gotten into the major search engines (including Google). 1. Effortlessly flood your website with more backlinks -- Upwards of 100s, if you use it effectively. 2. Get any page you want visited by the major search engine spiders (including Google) in 3 days or less! 3. Gain significantly higher search engine rankings in 7 days! 4. Enjoy up to thousands of targeted visitors (from your unique content) pouring into any website you want (this alone could equal a nice affiliate pay-check). 5. Plus, get possible contacts from the media for HUGE promotional opportunities. Highest Possible Gain in Search Rankings, With the Least Amount of Effort, in the Shortest Possible Time. Combining the Power of Internet Press Releases and This New Press Release Software! It's Called Press Equalizer! -- A new tool from Rod Beckwith and Jeff Alderson. You may be familiar with a few of these other tools under our belts, including Blogging Equalizer, Traffic Equalizer, Adword Analyzer, and many other tools that increase profits and save time for marketers, webmasters, or search engine experts like yourself! 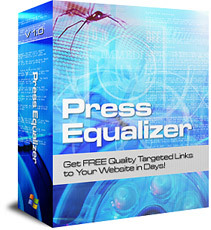 Press Equalizer is an easy-to-download PC software you can run right on your computer (zero costly monthly payments). It allows you to take full advantage of online press releases (a unique type of content many website owners crave) by helping you to create them at lightning fast speed and then distributing them for you! 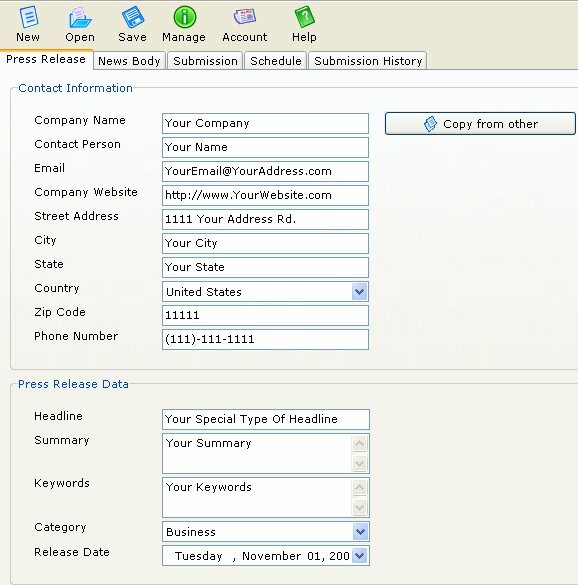 All you have to do to is fill in some blanks, then let Press Equalizer take your press releases and distribute them to a select list of special submission sites. That's it. Getting more backlinks, search engine spiders, and traffic could not get any easier than this. Yesterday I sent out a really basic press release about my company being hired to provide search engine optimization for a new client called CrimeNC.com, which provides online criminal background checks. I was amazed to see that 24 hours later, there were 88 references to this press release on Google! I have never seen such a powerful tool and plan to use it much more often for my company and my clients. Thanks for developing this wonderful power tool! Before using Press Equalizer it would cost me over $400 per press release. Now I can issue a press release every week and it costs me nothing. The links that get generated are great. Your Press Equalizer works great for me. I sent out a press release last month that got us free exposure in one of the main publications for our Industry! I couldn't have done it without Press Equalizer. All I can say is WOW and THANKS! 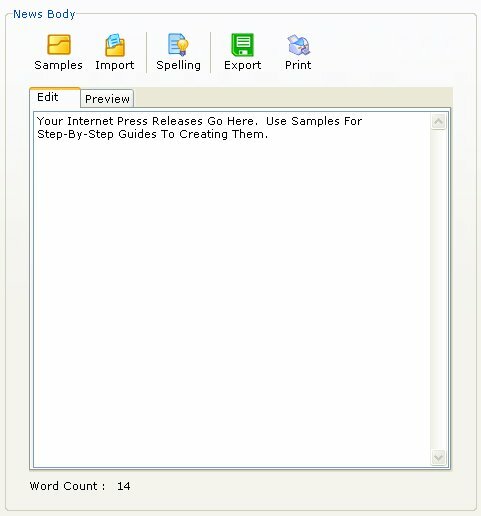 Press Equalizer gives me complete control over all aspects of creating, submitting, and even archiving all my press releases. 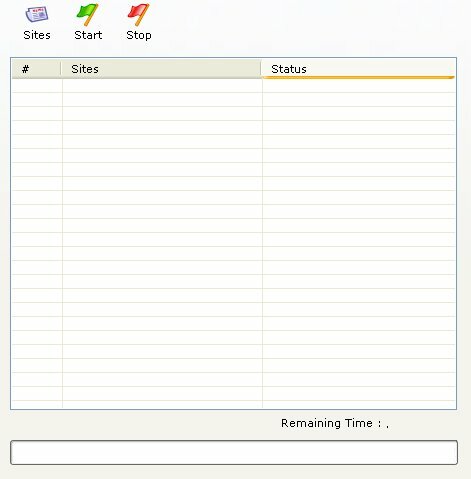 You've included a default list of media sites I can submit to AND I can even subscribe to some of them right from inside your software. Heck, you even included several different press release templates! The media better get ready for a BIG flood of information, because you've just made sending out a press release quick and painless. I've been wanting something like this for a long time! We all know that press releases are a backdoor to get sites indexed and receiving traffic, BUT submitting sites manually is too time consuming - until NOW. 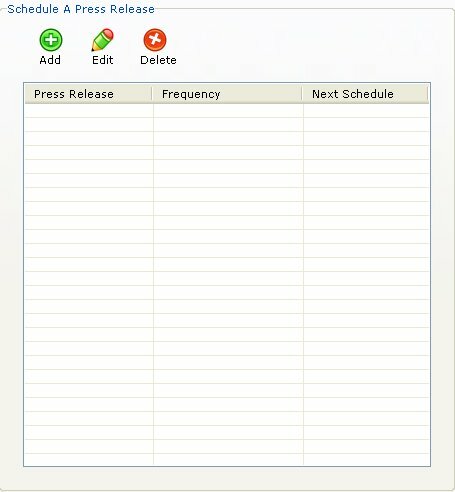 It's a breeze to use Press Equalizer and I can submit multiple sites to various press release sites quickly and easily. My sites get back links from those high PR sites instantly, which help my sites ranking. Not to mention that I get additional traffic from those press releases. It's an excellent piece of software! As you can see, only a short time after use, you are able to dramatically boost your search-engine rankings and wipe out your uninformed competition. They'll have no idea what hit them. All they'll know is you took their top-positions from right under their noses. 2. Create the content of your press release (Optional templates show you step-by-step what to include for maximum results). Your effort is down to a minimum. It takes only a tiny fraction of the time and effort required to write and submit traditional articles to directories. 3. Hit "Start." Then, watch the progress as your press release is submitted to a list of select distribution sites. After that, you can use this strategy for all of your websites over and over again... until you've got so much cash coming in that you have little clue which direction it's all coming from! But, that's not all you can do with Press Equalizer. Get your websites into the major search engines, including Google in mere days (usually less than 3)! You won't have to wait many endless months for your site to get picked anymore... or struggle trying to get other time-consuming strategies to work. Have your press release compiled and submitted to distribution services daily, weekly, or in monthly intervals to give you the most possible exposure with a minimum amount of work. Automatically get up to 100s high-quality backlinks so you can enjoy more free time, instead of struggling to dig-out high quality reciprocal link partners or paying through your nose for one-way links. Enjoy links from high-quality, high-content sites which usually have high Page Ranking status with Google. This means your page rank and rankings with Google can't help but go to the top! Modify 12 unique, step-by-step templates detailing exactly how to create your press releases, so you can get these amazing results with less than 1 hour's worth of your time. Receive up to thousands of laser-targeted visitors to generate new sales over a short time period... which allows you to get a bonus pay-check from each press release you submit! Have your press release (designed just for the web) picked up by possibly 100's of websites from webmasters begging for your content -- giving you a surge of incoming links. Attract the media attention to be on television, radio, or published in print. Getting on even a local television channel with tens of thousands of viewers could be a HUGE windfall of cash for your business (not to mention the expanded credibility you get). Turn every new website you launch into a nearly instant success. You won't have to wait many endless months before you get search engine traffic. Instead, you get an instant buzz surrounding your product (essential for any new product launch). Submit a press release for any affiliate program (you don't even need your own website) and watch as sales pour in from all the traffic you send through your affiliate link. Uncover exactly what to include in each of your press releases for maximum results! Failing to do these right means you'll get a fraction of the results you could. Plus, Press Equalizer comes with a concise, 21-page report detailing, step-by-step, how to use this strategy we've perfected to make sure you can duplicate our success. This means you won't have any trouble getting up and running with wild success in the shortest possible time. I purchased Press Equalizer this morning, wrote my first press release at 3 pm and submitted it. Then I decided to read your tutorial on how to write press releases, which mentioned checking on googlenews.com. I searched using my keywords as you instructed and guess what? My press release is at the top! I honestly can't believe it... for an Internet trainee like myself it's a great buzz. This was the best money I have spent in a while! Well Jeff... I guess the Cat's out of the Bag Now! For some time, a small handful of us have known the power of using press releases to get out sites listed quickly. But thanks to your incredibly easy to use Press Equalizer, I guess EVERYONE will be doing it now, and our closely guarded secret won't be a secret anymore. Seriously though, it's a brilliant piece of software that anyone can easily use to put out quality press releases and get the benefits that up till now, very few knew how to do, or could afford to have done for them. I especially like the way your News Body samples lead the user through the process of giving the press exactly what they're looking for. You're known for putting out quality and timely tools to make the marketers life easier and more productive, and it looks like you've done it again. Can You Really Afford NOT To Use Press Equalizer? Get any page you want visited by the major search engine spiders including Google (without all the hard work) in 3 days or less. PLUS effortlessly increase the number of backlinks to your site. Then, you've only got to wait until the search engines find all those new links pointing to your site (for most of them it should not take long), and you will experience higher search engine rankings. Getting a copy of Press Equalizer to add to your arsenal of weapons to get an unfair advantage over your competition is an easy choice. Or taking the "backdoor" shortcut to the top of the rankings with your copy of Press Equalizer instead. Where you can gain up to hundreds of backlinks from high-quality sites and get your sites into Google in less than a few days! You deserve the better, easier way. Of course, you're probably wondering if you can afford it. Well, the best part of Press Equalizer is it does not cost you an arm and a leg. Nope. The Amount of Time You Save! You won't have to wait months for a new site to make money, or struggle with an affiliate program trying to get it to pull in a nice flow of cash. Instead of spending all your time trying to get your pages into Google or attempting to secure incoming links, everything is taken care of for you... with less than 1 hour of your time! So, how much is your time and extra income from higher search engine rankings worth to you? Well, you'll probably agree, the money you're now able to gain and extra time you get to enjoy is probably worth a lot more than your investment in Press Equalizer... only $247 $47 bucks that you will likely make back almost right away (in as little as 7 days)! Additionally, it's only a tiny fraction of what a press distribution service would charge you for just one press release... likely as much as a big fat $250.00. Press Equalizer is amazing man! It's SUPER easy to use. Just fill in the blanks and submit. What a great way to get a boost in PR, more backlinks, traffic AND sales! I'm making Press Equalizer a regular part of my marketing arsenal NOW! Thanks bro -- yet again you rock out another KILLER tool. I've got to say Press Equalizer absolutely rocks and it's a long time coming! Press Equalizer is also a *complete* system all rolled into one for marketing ANY Web business successfully! The lifetime benefits of using Press Equalizer far outweighs the measly investment required. In fact, it's software EVERY online business owner should use. You're also going to get a very special bonus we are selling for $47.00 here. It's called "Submit Equalizer." This gem automatically submits all of your websites to thousands of High-Quality (and researched) search engines, classified sites, and directories... To give any website you want a deluge of instant visibility. It's even constantly updated with new, quality resources to submit your website to. This means the value of this software grows! Because, unlike other software products that go out of date quickly when a more advanced one comes out, you'll get FREE Upgrades. This means you will always own the latest, up-to-date version to fully take advantage of this "backdoor" shortcut. So, if a new feature comes out that boosts the value of Press Equalizer, then you won't have to pay a thing, and you'll get the new advancement without doling out an extra cent. "You CAN'T Lose 60-Day Personal 100% Money Back Guarantee!" My partner and I are so confident you're going to love the results you get with Press Equalizer...When you grab your new copy right now, you get our ironclad, 100% 60-day money-back guarantee! This means you get to try Press Equalizer for a risk-free test-run!... Because if you don't get dozens, up to hundreds, of new backlinks, have your website flooded with the major search engine spiders, and generate new sales from thousands of targeted visitors, then you get ALL of your investment handed back to you! P.S. If you're thinking about writing press releases by yourself, watch out... It's just not possible to get the results you're looking for... because along with all of the extra time it's going to take you to write and distribute your releases, you're also going to miss-out on our select group of online distribution sites... Not to mention, you won't get our proven tips to making sure your releases give you the search engine benefits you're looking for. The improvement in results you get with Press Equalizer are immense! Besides, if Press Equalizer does not live up to your expectations, you get all of your investment handed back to you. You don't even have to give a reason. So, why wait? Go ahead and grab you copy now and start making money almost right away!